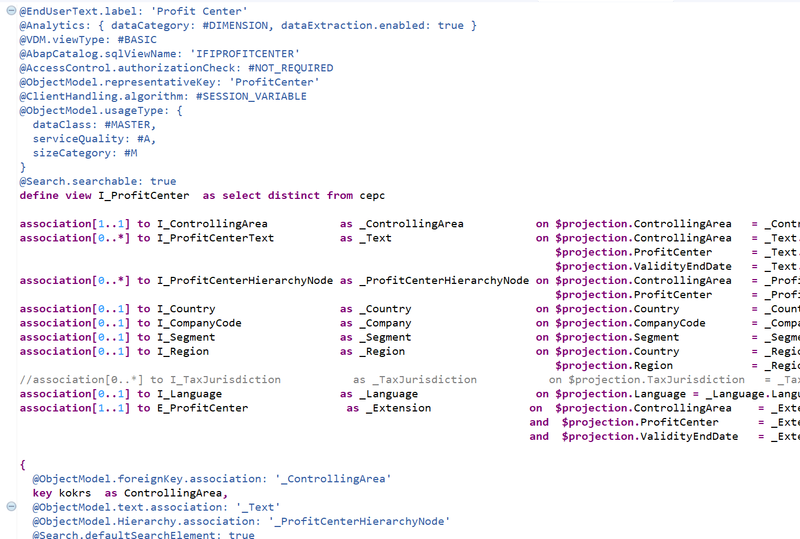 This blog illustrates how to find the predefined VDM (template of the CDS View for business entities in S/4HANA) for a table, e.g. 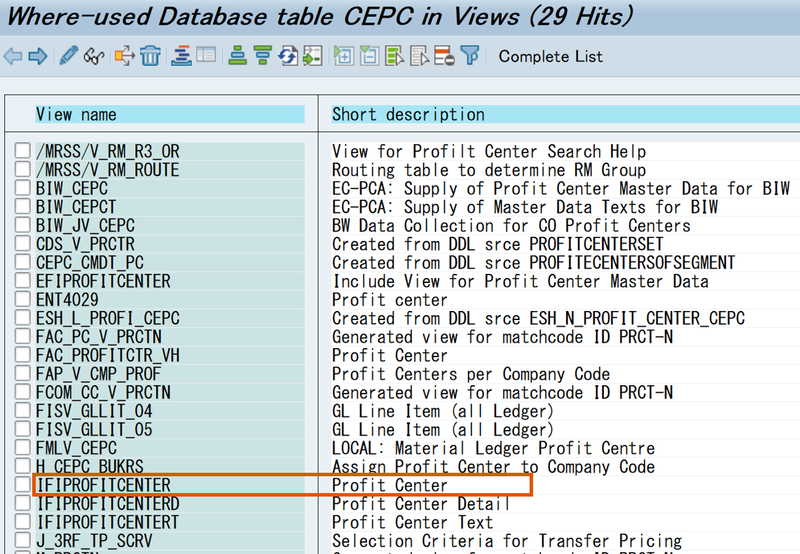 finding the VDM “I_ProfitCenter” for the table CEPC. Predefined VDM is one of the key in S/4HANA architecture, but I feel not so many customers enjoy them, and one of the reason is, I believe, it is difficult to find the Predefined VDM they want to use. As ERP experts have already been familiar with the tables in ERP, I think one of the easiest way to find the appropriate VDM should be to find it with the table. This method should help reduce the development effort, by using a predefined VDM instead of creating custom CDS Views for the business entities in S/4HANA. 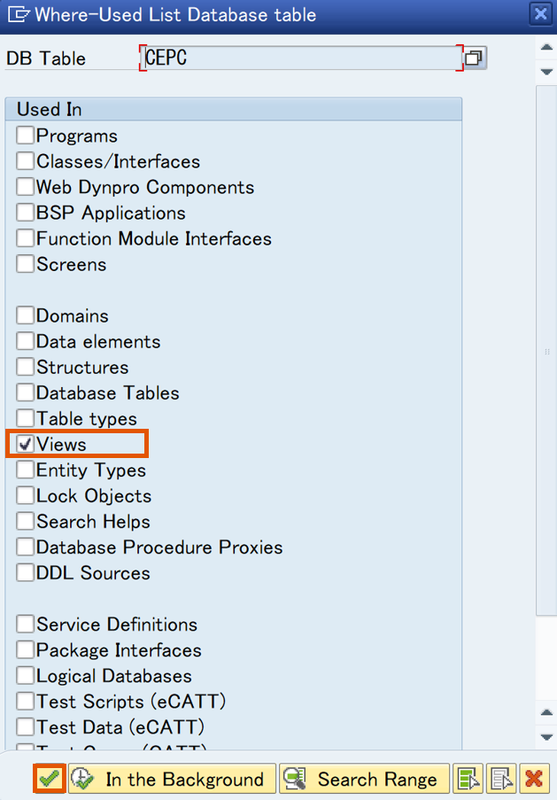 By searching “Views” in Where-Used List for a table in Transaction SE11, the candidates of SQL Views of the predefined VDM (CDS View) are listed. The object name you are looking for should start with “I”, “P” or “C”. 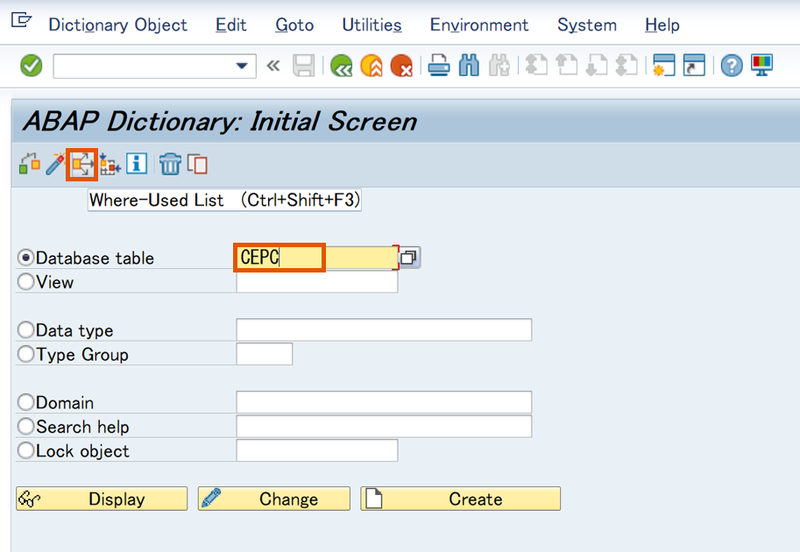 After selecting an entry, the definition of the selected SQL View is displayed. “DDL Sources” (=CDS View) can be selected in the Where Used List, however sometimes the Where-Used list does not list all the CDS Views (for example more complex VDM’s may not always be included). 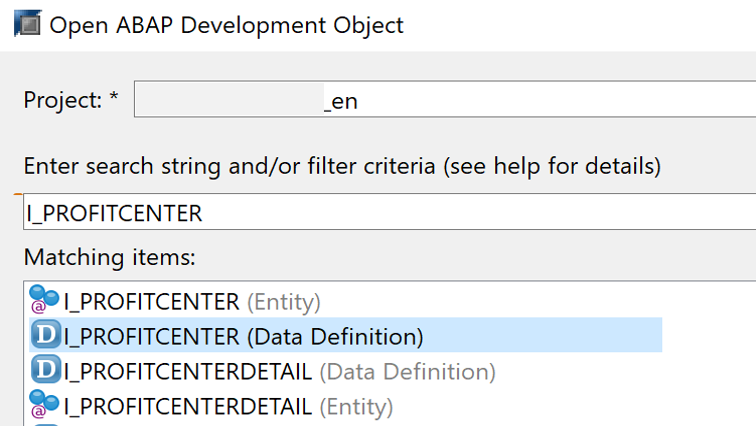 Where-Used List is also available in ADT (ABAP Development Tools in HANA Studio), however this is likely to take long time as it is not possible to search “Views” only. In this way, only the SQL Views directly using the table as a source are listed (select from <the table>), so that further steps might be needed for more complex predefined VDM. But most of the predefined VDM for master data and simple transaction data (Interface Views) can be searched. 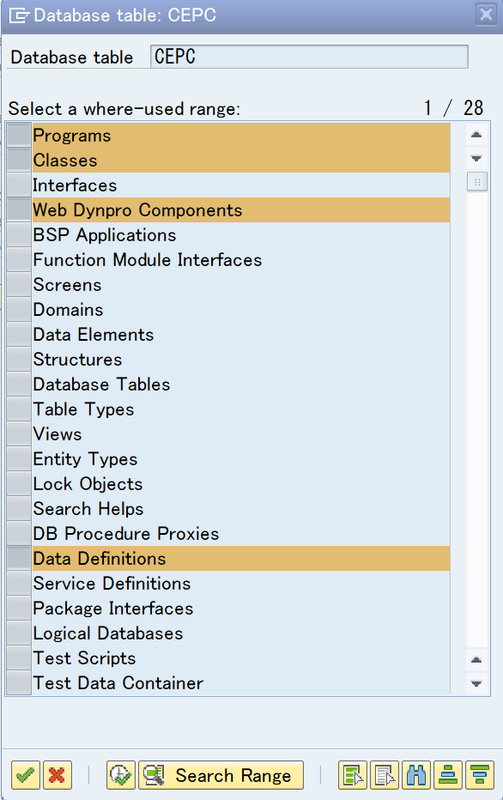 For searching the VDM, general way is to use Fiori View Browser, but you might not be able to find enough info with the tool, and Where-Used List is available in ADT, but it would take long time as it is not possible to filter with objects, e.g. “Views”. How can the predefined VDM’s be used? Predefined VDM’s can be used to create custom CDS Views. It is possible to create Consumption Views from predefined VDM’s, and master predefined VDM’s can be used for custom transaction CDS Views (see the blog). 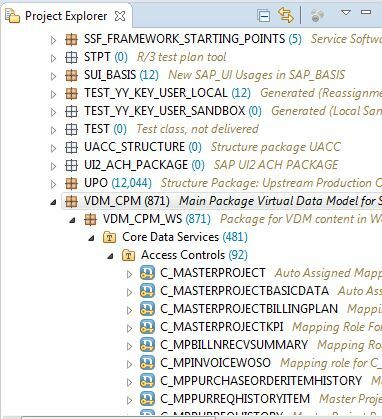 Furthermore, predefined VDM’s can also be used in ABAP programs (SELECT ~ FROM <CDS View>) and some can work as the source to send data to BW, or external systems (using ETL tools like Data Services, CPI-DS, SDI). 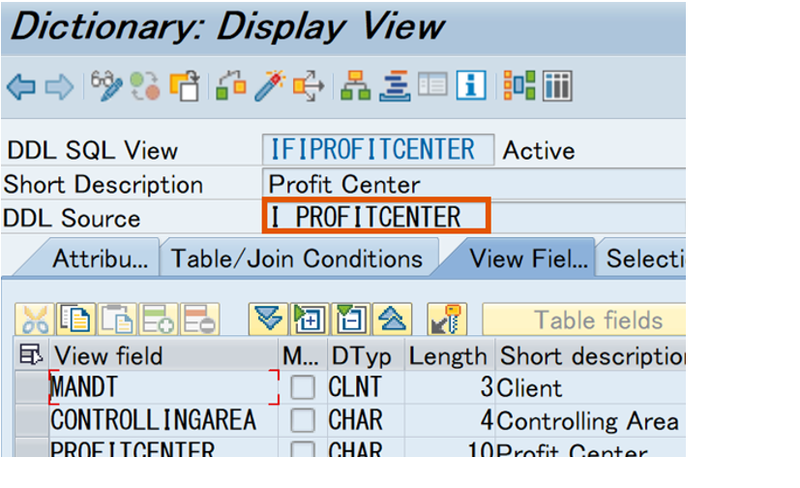 In this step, the predefined VDM for ProfitCenter is found from the table CEPC via transaction code SE11. Select “Views” only and deselect others, ad select Execute. The view names are listed (see below). Check the views whose name is starting with “I” (or “P”). In this case, there are 3 views starting with “I”. From the short description, it seems the first one (IFIPROFITCENTER) seems to be the appropriate one. Double-click this entry. CDS View includes SQL View, and the SQL View is listed in this way. The naming rule of SQL View used in CDS View is “<prefix of VDM type>+<Component ID>~”, e.g. IFIPROFITCENTER. Regarding prefix of VDM type, “I” is used for Interface View, “P” for Private View, and “C” for Consumption View. Interface Views should be the target of the search, as Interface views are generally regarded as the “go to” reuse views.. 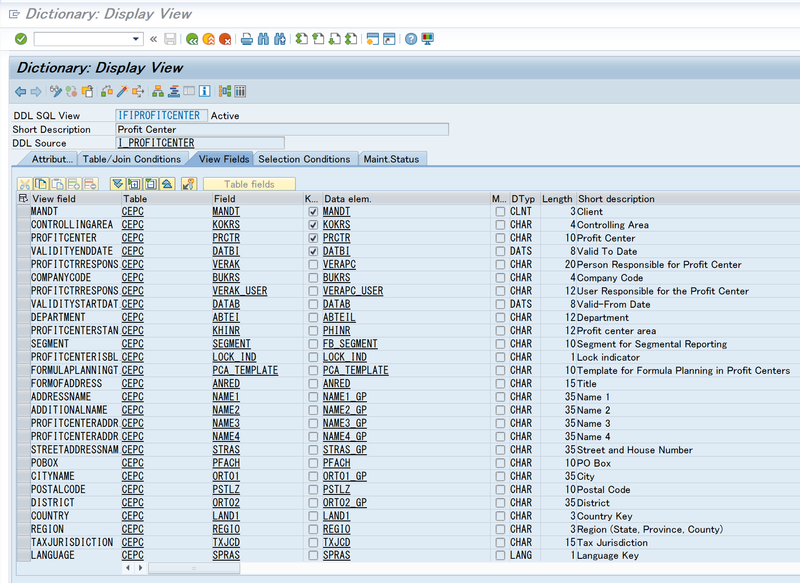 The definition of the selected SQL View is displayed. The name in “DDL Source” field is the name of CDS View. If the name is started with “I_”, it should be the predefined VDM (as now the SQL View name is started with “I”). For some views, it is possible to run “Contents” (data preview) in this screen, but for other views, it is not possible, e.g. when the corresponding CDS View has the parameters. By double-clicking the DDL Source name, the source of CDS View is displayed. Source of the CDS View. In SAPGUI, it is also possible to display the source of CDS View with the program “RUTDDLSSHOW2”. Of course, it is possible to open this predefined CDS View in ADT. Search with the DDL Source name (“I_PROFITCENTER”) and select the listed CDS View. The definition of the CDS View is displayed. It is also possible to search “DDL Sources” (=CDS View) in Where-Used List. But unfortunately, not all the CDS Views using the table might be listed. In many cases, it could be fixed by running the program SDDIC_DDLS_INDEX_ALL_SOURCES, by which the necessary records are filled in the table DDLS_RIS_INDEX. 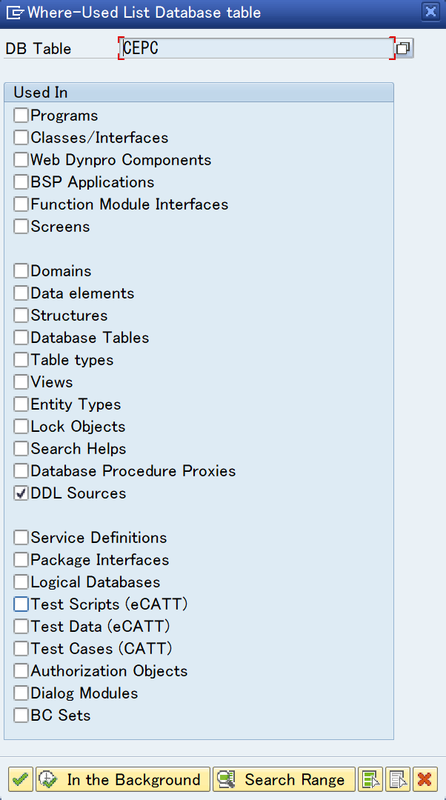 Select “DDL Sources” only and deselect others, and select Execute. In S/4HANA 1809 (or ABAP Server 7.53), “Data definitions” is used instead of “DDL Sources”. The view names are listed. Check the views whose name is starting with “I” (or “P”, “C”). I like it! A new way to find things. That are about 20 million different ways to do the same thing. I’ve just started playing with Eclipse. 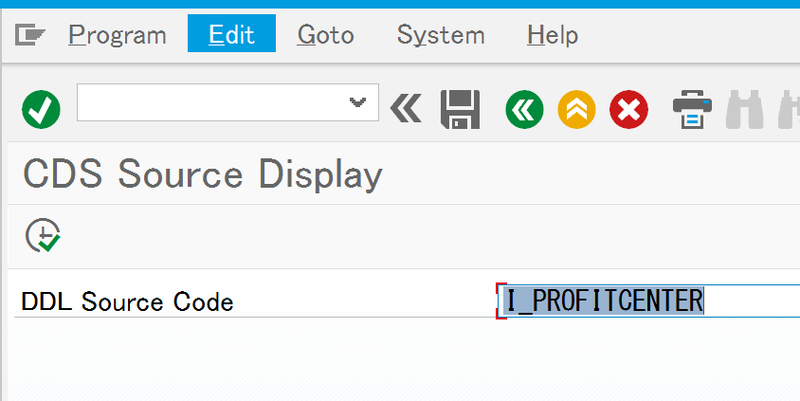 Some of the debug is MUCH better on the SAP GUI instead of Eclipse anyway. I probably am missing some of the “VDMs”. I like looking in a general way for them. I open the package (not always this one) , and search there. Thank you for a great instructional blog!